Harold Alzana was, from the late forties to the mid-sixties, a star fixture of Ringling Bros. and Barnum and Bailey Circus. His daredevil manner—working on the high wireA tight, heavy metallic cable placed high above the ground, on which wire walkers do crossings and various acrobatic exercises. Not to be confused with a tight wire. without a balancing pole and at high speed, which contrasted with the traditionally slow, seemingly careful, approach of the great high wireA tight, heavy metallic cable placed high above the ground, on which wire walkers do crossings and various acrobatic exercises. Not to be confused with a tight wire. 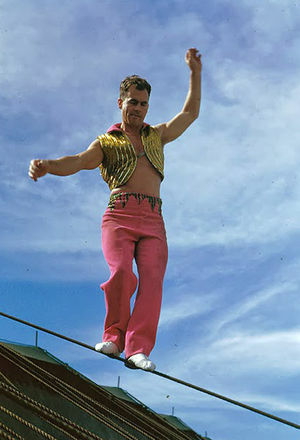 acrobats, such as The Wallendas, that had preceded him—inspired many of the high wireA tight, heavy metallic cable placed high above the ground, on which wire walkers do crossings and various acrobatic exercises. Not to be confused with a tight wire. acts that are seen today. He was born Harold Davis on September 19, 1917 in Maltby, a small mining town east of Sheffield in South Yorkshire, England. His father, Charles, worked there as a coal miner, but he was also an amateur acrobat, and he began training his children (Harold, his brother Edgar, and their sisters Hilda and Elsie) in his backyard, where he had installed a tight wireA tight, light metallic cable, placed between two platforms not very far from the ground, on which a wire dancer perform dance steps, and acrobatic exercises such as somersaults. (Also: Low Wire) two feet off the ground. Charles’s training got good results: At age six, young Harold made his performing debut in local fairs and festivals. But this was just fun; when he reached fourteen, Harold Davis, like most young men in Maltby, followed in his father’s footsteps and began working as a coal miner. In 1941, he married his sweetheart, Minnie. World War II was raging, but Harold and his siblings never stopped practicing and improving their high wireA tight, heavy metallic cable placed high above the ground, on which wire walkers do crossings and various acrobatic exercises. Not to be confused with a tight wire. act. The war over, Harold Alzana decided to leave the darkness of Maltby coalmines and tempt his luck in the circus spotlights: It was social climbing in every sense of term! His break came in 1946, when impresario Clem Butson, then producer of Blackpool’s Tower Circus, gave "The Sensational Alzanas" (as Harold and his siblings had named their act) a contract for the summer season. The highlight of the act was Harold crossing the wire on a bicycle with his sisters hanging from a trapeze suspended under it.